Schwabing is one of Munich's most bohemian districts and most expensive residential areas. The large number of shops, restaurants, and cafés along the district's main boulevards Leopoldstraße and Hohenzollernstraße cater mostly to those with money to burn. The hamlet of Schwabing was originally founded in the 8th century and therefore is much older than Munich itself, which was founded in the 12th century. It was incorporated in the city of Munich in 1890. In the 19th and 20th century, Schwabing reached its zenith of cultural importance. Many famous litterateurs and painters were living in the area by that time. Schwabing was also location of the Schwabing riots in 1962, the overture of the student revolt in Germany in the late 1960s. The English Garden (German: Englischer Garten), a large public urban park, created in 1789-1792, is directly east of Schwabing. With an area of 370 ha (910 acres) it is bigger than New York's Central Park or London's Hyde Park. It is designed as a informal landscape park, which was popular in the late 18th century. Following the style, the English Garden has a number of eye-catchers like temples, a teahouse, pavilions, and a pagoda, but the main features still are meadows, a gently rolling terrain, ponds, and a forest background. Since the 1966 the English Garden is devided into a southern and northern part by the Mittlerer Ring expressway. On days with fine weather Munich's English Garden nowadays is the main recreational area of the locals (and especially the students of the nearby universities) to sunbath, relax, and have a beer or two. Vast open meadows, nearly 80 km (50 mi) of biking trails, hiking trails, and bridleways make it a perfect place for any kind of sports activity. During summertime it is also the venue of makeshift concerts and gratis performances. The area of Schwabing and English Garden is bounded roughly by the Isar river to the east, Georgenstraße to the south, Schleißheimerstraße to the west, and Petuelring (B 2R), autobahn A 9, and Föhringer Ring to the north. Being one terminus of autobahn A 9, the area is easily reachable by car from the north by using the exits Frankfurter Ring (75) or Schwabing (76). From all other directions, the most convinient way to get to the area is Mittlerer Ring (B 2R), Munich's circular city expressway. The main arteries serving the Schwabing area in north-south direction are Leopoldstraße and Ungererstraße in the east of the district, and Schleißheimerstraße in the west. The main connections between those are Mittlerer Ring (circular expressway around the extended center of Munich) in the north, Rheinstraße/Karl-Theodor-Straße in the center, and Franz-Joseph-Straße in the south. However, arriving in the area by car isn't the best idea. Though traffic outside rush-hours is mosly low, parking is very limited and usually only allowed for residents of the surrounding blocks with special parking permits. Subway line U2 (red) runs from Munich Central Station in northern direction and serves several stops, including Hohenzollernplatz and Scheidplatz. It covers the western part of the district. Subway lines U3 (orange) and U6 (blue) run from Marienplatz and follow Leopoldstraße north to serve the eastern part of Schwabing and the English Garden. Stops include Universität (for the English Garden), and Münchner Freiheit. At Münchner Freiheit the U3 branches off to the west to stop at Petuelring in north-western Schwabing and proceed to the Olympic area, while the U6 continues in northern direction to Fröttmanning (for the Allianz Arena soccer stadium and a huge park-and-ride parking garage). Tram line 12 runs in west-eastern direction and connects Schwabing with Neuhausen-Nymphenburg and the Olympic area. Tram lines 27 and 28 run from Karsplatz (Stachus) through Schwabing from south to north with a large number of stops along Nordendstraße and Belgradstraße, including Kurfürstenplatz, Scheidplatz, and Petuelring. As Schwabing is very bike-friendly, with bikeways along every larger street, and generally not too much traffic going by bike is probably the fastest way to get to the area. There are a plethora of bike rentals around the city. English Garden is directly adjacent to the north of the historic city center of Munich and therefore very easily reachable on foot. To get to Schwabing proper on foot, you'll need to walk approx. 20 min north along Ludwigstraße to reach the southern tip of the district at the University of Munich. Given the area's not too small north-south extent the best way for the not too sporty traveler to get around in the area are Tram lines 27 & 28, which run along the center of the Schwabing area in north-south direction, or subway line U6 for the English Garden and the easternmost parts of the district. Tram line 23 runs in the very north and serves the rather residential neighborhoods there. For travellers, who seeks independence from public transportation and are keen to explore the area on their own, renting a bicycle is the best idea - there are a plethora of bike rentals around the city and there are bike lanes along every larger street. 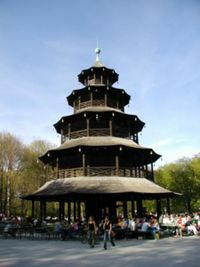 Chinesischer Turm is one of the main landmarks of Englischer Garten. Olympic Park - If you liked hanging around English Garden, you might want to see the Olympic Park, a more modernly landscaped park, built for the 1972 Summer Olympics, to the west of Schwabing. This page was last edited on 24 February 2019, at 03:39.